A new partnership between the University of Ottawa and the University of Calgary Faculties of Law will help address access to justice issues for French-speaking litigants in Alberta. The Certification in Common Law in French (CCLF) will give University of Calgary students with French language skills the opportunity to obtain a certification from the University of Ottawa’s French Common Law Program during the completion of their JD program. The CCLF will not only provide better access to justice for residents in Alberta, but will allow graduates increased opportunities to participate in clerkships with the Supreme Court of Canada, the federal courts, and the federal public service. The University of Calgary began offering two courses in French a couple years ago, with an amazing response from students. “We are very excited to start this partnership with the University of Ottawa and to give students the opportunity to enhance their future legal careers and their impact on the justice system across the country,” said Dr. Ian Holloway, QC, dean of the law school. “Not only does the CCLF increase the students’ access to work throughout Canada where knowledge of both official languages is an advantage or a necessity, it helps improve access to justice for French-speaking litigants,” says Professor Caroline Magnan, director of the program. 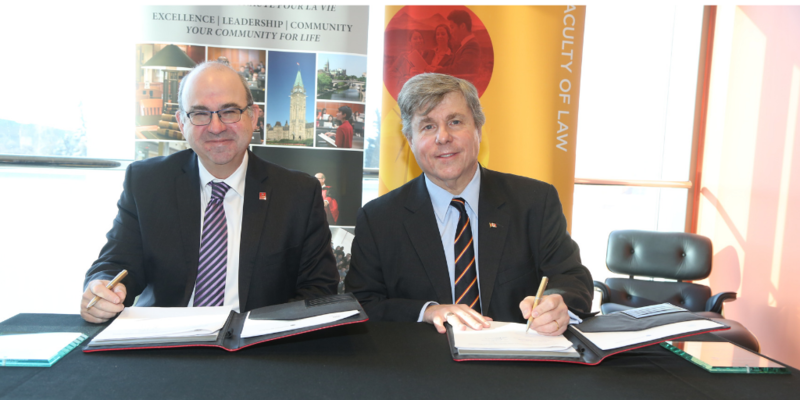 This partnership makes the Faculty of Law at the University of Calgary only the second law school in Canada to offer the CCLF with the University of Ottawa.